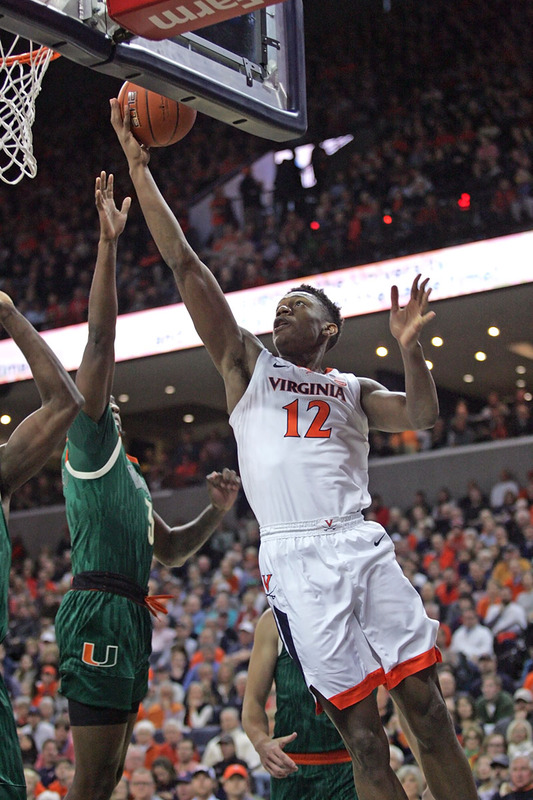 The Virginia basketball team picked up another home win last Saturday against Miami to move to 20-1 on the season. The 56-46 victory, however, carried a similar vibe as the win before it, a 66-65 overtime W at NC State. In both contests, the Cavaliers looked off-kilter despite finding the winner’s circle. Throw in the fact that Ty Jerome sat out the Miami game with a back injury – his status remains unclear for the Duke showdown this weekend – and fans started swapping thoughts and concerns about the double grinders. While mid-season spells are common and should be expected, Virginia fans are dreaming about a Final Four breakthrough so any sputtering performances can be disorienting in a way. Still, there were plenty of interesting moments in the Miami game so the Double Bonus is back for a closer look at the latest win before the Duke rematch. As noted, the last two games with NC State and Miami have had some similarities in vibe. The home game with Miami repeated a successful play from the game in Raleigh too, though. In both contests, UVA dialed up some ball screen offense that led to alley-oop plays at the rim.